Temecula Valley Southern California Wine Country celebrates Temecula Valley Restaurant Month with prix-fixe menu items and local farm-fresh ingredients. In addition, select restaurants will have special events, workshops and activities during the month of January, which will culminate with a Wine Country Barrel Tasting on January 30th & 31st. Temecula Valley Southern California Wine Country celebrates Temecula Valley Restaurant Month with prix-fixe menu items and local farm-fresh ingredients at restaurants in Old Town Temecula, Temecula Valley Wine Country, Pechanga Resort & Casino, and throughout the destination. The celebration takes place from January 1 to January 31, 2016. In addition, select restaurants will have special events, workshops and activities during the month of January, which will culminate with a Wine Country Barrel Tasting on January 30th & 31st. Visit Temecula Valley and the Temecula Valley Chamber of Commerce are excited to participate in California Restaurant Month for the sixth consecutive year. With menus including special prix-fixe lunch ($10-$15-$20) and dinner ($15-$20-$30) options, as well as other events and activities at participating restaurants throughout January, it is a great opportunity for locals and visitors to experience some of the best wine and food in Temecula Valley Southern California Wine Country. As a favorite destination for culinary travel, Temecula Valley offers a vast array of culinary experiences, from ethnic to gastro pub to fine dining. Temecula Valley is part of an prolific agricultural region of small farmers. Restaurants are able to locally source pork, beef, vegetables, citrus, apples, berries, cheese, olive oil, craft beer, wine – it’s a chef’s dream. 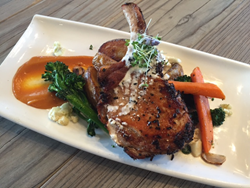 Visitors are attracted to the fresh, real food found at Temecula Valley Southern California Wine Country restaurants. During Restaurant Month, visitors can immerse themselves in all things culinary throughout Temecula Valley, such as farmers’ markets, special chef events, Restaurant Month menus, cooking workshops, wine tours, and a Barrel Tasting celebration. Temecula Valley’s wealth of fresh, local ingredients, paired with innovative chefs, farmers and culinary artisans means visitors can enjoy cuisine as diverse and robust as the destination. The middle of the week in January is an excellent time to visit restaurants and explore all there is to do and see in Temecula Valley Southern California Wine Country. Weekdays are less busy and can yield conversations with chefs, winemakers, and winery owners themselves. Midweek visits also mean visitors can receive more personalized attention, as well as exceptional rates on overnight accommodations. Hotels and resorts offer special Sunday-through-Thursday (better than weekend) nightly rates starting at $72.00 during Temecula Valley Restaurant Month. To learn about all the participating restaurants, special events and activities, Temecula Valley Restaurant Month prix-fixe lunch and dinner menus offered throughout January 2016, please visit RestaurantMonth.org. Welcoming 2.6 million visitors each year, Temecula Valley is located 60 minutes from San Diego and Orange County, and within 90 minutes of Los Angeles and Palm Springs. With natural gifts of climate and geography, Temecula Valley is widely recognized for its scenic vineyards, award-winning wines, and gracious and friendly wineries as Temecula Valley Southern California Wine Country. The popular boutique destination includes the Temecula Valley A.V.A. (American Viticulture Area) as well as Downtown, Old Town Temecula, and Pechanga Resort & Casino. Visit Temecula Valley, the region’s official tourism marketing organization and resource for visitors, is online including a complete daily events calendar at VisitTemeculaValley.com; “Temecula Valley Southern California Wine Country” on Facebook; and @Visit_Temecula on Twitter. The Temecula Valley Visitors Center is located in Downtown, Old Town Temecula (Third Street and Mercedes) adjacent the Old Town Temecula Parking Garage. For visitor information and assistance, please call 888-363-2852 or 951-491-6085.